As the younger sister of one of the infamous Lords of Vice, Lady Regan Bishop is no stranger to her brother, Frost, and his friends’ wicked ways. After all, she was practically raised by them following her father’s death and her mother’s desertion. After an amateur science experiment goes awry, Regan is whisked away to safety by one of her brother’s friends, Lord Hugh Mordare, whom Regan has always felt more than brotherly affection for. They get caught up in the moment and share a kiss . . . which is intruded upon by Frost and a distant cousin, Lady Karmack. The lady has been hounding Frost to send Regan to boarding school for months and this incident becomes the perfect catalyst to sway his mind to her suggestion. So, off to boarding school a very unhappy Regan goes. Five years later, Regan returns to London with the full intent of pursuing that kiss and more with Dare. Dare has never forgotten that kiss with Regan and the feeling of wanting to do it again is intensified when he first spies her at the theater after five long years away. The attraction is still there, but Dare is hesitant to act upon it because she is his friend’s sister and he already has enough problems to deal with in his own family. He and his brother Charles, the future duke, have never gotten along and have come to blows many times—especially since years ago, Charles stole and married the only lady Dare has ever loved. But can he open his heart and take a chance on love again with the beautiful and very desirable Lady Regan? I absolutely adore storylines where the heroine is in love with her brother’s best friend and After Dark with a Scoundrel is now one of my favorites! The intensity between Regan and Dare sizzles on the pages and as much as Dare tries to keep away from her, he just can’t help himself. She is his weakness and his attempt at doing the right thing makes for some delicious tension. And oh, how I love sexual tension in my books. “Enough!” He gestured at the door. “You should retire to your bedchamber,” he said hoarsely. Dare turned away, attempting to shield Regan from his lust that was so blatantly defined under his trousers. Even with her unconventional upbringing with Frost as her guardian, Regan could not possibly understand what Dare wanted from her. That knowledge gave him strength to let her leave the room. Regan did not move. “I would rather continue kissing you,” she said shyly. Without glancing at her, Dare groaned and scrubbed his face with his hand. He had always known that he would succumb to some form of madness if he laid a hand on Regan. Dare glanced up at her refusal. He had not thought it possible, but Regan was even lovelier with her blue eyes glittering with anger and her red lips slightly swollen from his kisses. These two had amazing chemistry together and it was so strong that I felt it, too. I really connected with them and Dare absolutely stole my heart! One thing I enjoy most about Alexandra Hawkins’s writing is how well she grasps the male point of view and how often she uses it—which is great since the series revolves around the seven Lords of Vice. After Dark with a Scoundrel is my favorite of the series so far and I can’t wait to see which Lord of Vice will succumb to the pitfalls of marriage in Ms. Hawkins’ next book. My vote is for Vane, but we’ll just have to wait and see. In the meantime, pick up After Dark with a Scoundrel and lose yourself in this wonderful story! Alexandra Hawkins has graciously offered to send a copy of After Dark with a Scoundrel to TWO lucky commentors living within the U.S. and Canada! Thank you, Alexandra! Wooohooo, this sounds so good. I too love the in-love-with-my-brother's-friend storyline. Andrea, great review! I really need to get this one! I love Alexandra's writing and this latest book in her Lord's of Vice series is on my TRL. Sounds lke Dare and Regan have some heated chemistry. Count me in.Great review. This sounds like my kind of book! Love the premise. It is a great premise, isn't it, Margay? I hope you enjoy it! Thanks for the wonderful review, Andrea! I am not eligible to participate so please don't sign me up. I just wanted to stop by and say that this book sounds so good and I'm excited to read it. It's so nice to know that the hero's POV is an important part; I really like that. Wonderful review! The tale definitely sounds good. I enjoyed the little teaser you gave us. I love when the heroine makes the hero "suffer" *wink* especially unknowingly. I'm looking forward to picking this one up. Ooh, great synopsis and review, Andrea! This sounds like one to add to the TBB list. This book sounds fantastic and the cover is gorgeous! I will have to check this series out! :) Thanks for the great review, Andrea! I'm so glad you like the review, Alexandra. :) Can't wait to see who captures Vane's heart and how she does it! Thanks for stopping by, Antonia! As women, we know how women think, so it's nice to read about a man's POV, isn't it? I still haven't read this series, but I plan on it, especially after reading your great review, Andrea! Alexandra, I love "sexual tension" and can hardly wait to read the rest of this book. Thanks so much for being here to share it with us. Andrea, you silly goose. You wrote that two copies were going out "to TWO lucky commentors living within the U.S. and Canada!" Now I don't live in the U.S. AND Canada, but I DO live in one of them, LOL! Perhaps the word "or" should have been used? Have a great day, ladies, and thanks for sharing the love! Thanks for the interesting review. I haven't read anything by this author yet, but it's always nice discovering someone new. Sounds like a great book! Love the cover!! I can't wait to read this book! This one looks hot! I love Alexandra's books! She is a wonderful author. Thanks for a great post! I can't wait to read this next installment in the Lords of Vice series. I am loving it so far and After Dark with a Scoundrel looks so good. Thanks for the great review. I haven't read any books in this series yet, but it sounds like a series I would enjoy. I especially like that the books feature the hero's POV. This book sounds right up my alley. I do enjoy stories were the heroine falls for her brother's best friend. Plus, the dialogue between the characters in the scene posted really sparked off the page. Thanks for the review. Cannot wait to read this. The excerpt sounds wonderful and I have been waiting for it to be released. SQUEE! More books in the series! YIPEE -- SKIPEE! This one has it all -- The cover, The blurb. Oh, let's not forget, the all important, the author. I want, I want! Thanks for stopping by, Penfield! Lisa B aka Modokker, Alexandra has been blessed with gorgeous covers on all her books. Can't wait to see what the next one looks like! Johanna, yes, she is a wonderful author! I hope you enjoy it, June! WOOHOO!! Great news, Alexandra!! Congratulations!! Isn't that great news, Cynthia?!?! I am thrilled. Enjoy ADWAS! Great review. I'm definitely looking forward to reading Alexandra's new release. Alexandra said ... Last month, St. Martin's Press offered me a four-book contract to write Vane, Saint, Hunter, and Frost's books. That is so wonderful for you, Alexandra!! Congrats on the new contract! I am on pins and needles waiting for this book to be released! Purchasing this for the Kindle will be the first thing I do Tuesday morning!! Great review! I loved "Till Dawn With the Devil" and can't wait for this one! 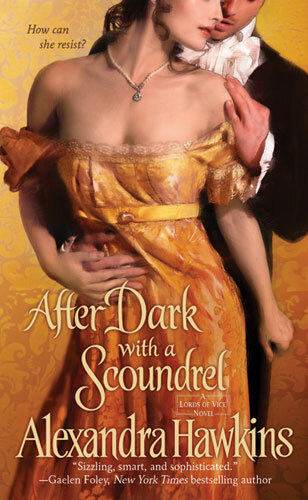 I enjoyed the review and I'm looking forward to reading After Dark with a Scoundrel, it sounds fabulous. Great review, Andrea! This sounds like a good one! Can't wait to read this, great review! I read the previous book in this series, it was fantastic, so I have this on my radar! Being the brothers friend has advantages and disadvantages for the same reason - he know all about you. Who better to want your sister to wed than a close friend that you know and like. Then again, he'll know all your weaknesses and vices. A good plot device. Thank you, everyone! I'm so glad you liked the review and hope that you'll pick up this fabulous book! I love this author and am so excited to discover this series. I will have to buy them all :) thank you for such a great review. Thanks for the great review. This one is on my TBR list.